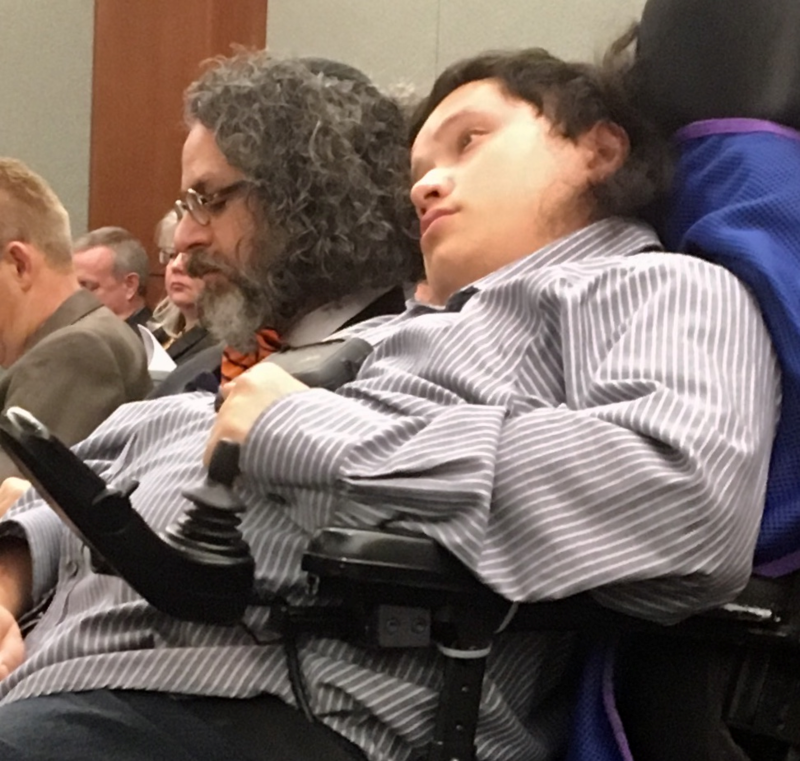 Jacob Hafter, Hanson’s attorney, argued that it took his client over six years to come to the realization that he had been ripped off, and only learned of his missing Special Needs Trust proceeds, and the missing proceeds from the under market value sale of his father’s condominium after attending a 2016 meeting of the Nevada Supreme Court Guardianship Commission at which time he was able to publicly confront one of his court appointed trustees, attorney Elyse Tyrell, who was serving on the Commission, and demand for the first time that she reveal where his missing funds were? Judge Jones carefully listened to the back and forth between opposing attorneys and ruled that an evidentiary hearing is needed to determine Hanson’s ability to comprehend and act upon information he received while attending numerous Clark County Family Court hearings between 2007 and 2015 relating to his guardianship. Attorney Hafter stated that his client’s physical condition prohibits him from being able to write legal papers. 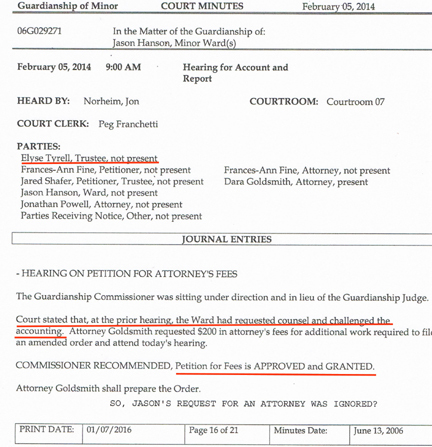 In March 2017, Commissioner Norheim testified before a Grand Jury that he always provides free counsel to litigants in guardianship cases, but he somehow neglected to provide such service to Hanson. In his Grand Jury testimony, Norheim was asked if his court appoints free attorneys to wards of the court who request one? Shafer’s attorney asked the judge if she would allow Hanson to be deposed regarding his ability to participate in the hearings subsequent to his 18th birthday? Judge Jones ruled that “time consuming, expensive” depositions were not necessary as long as she was provided videos of Hanson’s participation in the Family Court hearings in order to prove one way or the other whether he was able to file his own lawsuit against his alleged exploiters within the statute of limitations purported by defendant’s attorneys. Judge Jones scheduled an evidentuary hearing for 9:30 AM, December 21, 2017 in Dept 10. Jones’ courtroom “B” is located on the 14th floor of the Clark County Regional Justice Center, 200 Lewis Ave. in downtown Las Vegas, and Hanson’s next hearing is open to the public. We can file a class action tort against congress for “failure to act” to protect the people from these predators. Can this court-sanctioned Grand Larceny be eliminated within my lifetime. What can we do to hasten its demise?